This morning’s news about the continuing difficulties of the Co-operative Bank raised one obvious question in interviews and reports: will the brand survive? The survival of the bank, in one form or another, is highly probable. It’s difficulties relate to the future ‘financial resilience’ requirements of the Bank of England rather than immediate operational issues. These requirements broadly require banks to hold a higher proportion of capital assets than has been the case in recent history so that come another financial shock they will be better placed to withstand it than they were in 2008. 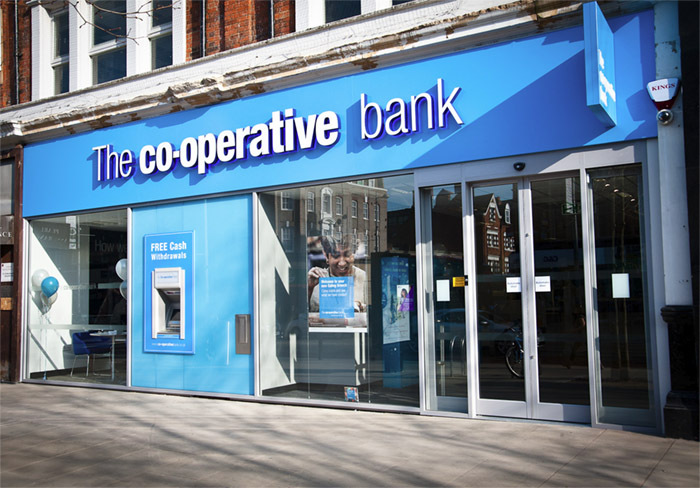 Getting to that threshold has proved a problem for the Co-operative Bank. A buyer with sufficiently deep pockets would get them out of this hole. The question is, however, would the Co-operative brand – associated with mutuality and ethical practice – survive or be subsumed. Beggars, as the saying goes, can’t be choosers. Thus the survival of the Co-operative brand within the banking sector will depend on whether or not the Co-op’s buyers believe that there is commercial benefit in retaining the Co-operative message. The brand, essentially, ‘belongs’ to the Co-op Group – the one that does the supermarkets and the funeral homes as well as a few other less well known notions. To say understanding exactly how the Co-op operates is tricky is something of an understatement. Behind the retail brand is a web of locally own mutual with democratic structures that buy in to the stores in some obscure way to which most of its modern-day customers seem oblivious. Nonetheless it has a reasonably clear ‘niche’ of ‘fair-trade’ and ‘ethical sourcing’. The bank was the choice for many for similar reasons. You knew where ‘your’ money was invested. You didn’t really, because that’s not actually how banks work of make money, but they need customers and that was one way they found them. Despite having squandered its position as the UK’s largest retail group in the 50s and 60s, the Co-op remains the seventh largest food retailer, only recently having been overtaken by discounting insurgent, Aldi. The bank clings to the brand based on 20% ownership from the Co-op group and its continuing its ethical financial policies. The uncomfortable fact, however, is that the Co-operative is a massively damaged brand. Confidence in banking is everything. Without it banks fail to prosper and, ultimately in times of shock, just fail because banking confidence is a matter of smoke and mirrors. The difficulties of the Co-operative bank are too well documented to be easy to escape – the brand symbolises those difficulties. The Co-op Group well knows this because the difficulties of the bank, its ‘colourful’ former Chairman, Paul Flowers – the Crystal Methodist and the less than ethical activities of other bank directors damaged the brand of the entire group. The Co-op may spin its reversion to the ‘Co-op’ brand and logo of the 1960s however it likes but nobody will ever convince me that repairing the damage done by the scandals at the Co-operative Bank was not THE key driver. So back to the original question – can the brand survive in the banking sector? My guess is not. First and foremost the damage outweighs any particular benefit the retention of the Co-op association might provide, secondly the interests of the Co-op Group would seem best served both financially and by brand association by just getting the hell out of banking and completing as far as possible the ‘cleansing’ of the Co-op brand. And finally, there are better non-mainstream brands around. Nationwide has long made a virtue of retaining its mutual status, and TSB, while not driven by ‘ethical investment’ policy plays on being the local retail banks – smaller, more trustworthy than the big players who made such a mess of it (including its former parent, Lloyds, of course. I can’t for the life of me see how the residual loyalty of a diminishing social niche could be sufficient for any suitor to outweigh the downside of retaining the Co-operative Bank as a brand. Nor can I see why it would be in the interests of the Co-op Group any longer to allow their brand to be subject to factors and owners way beyond their control. My guess is that in time and following its eventual return to the private sector, the NatWest and RBS banking brands too may have to be, erm, shredded. The moral of this tale is that there is a point beyond which the damage done to a brand, no matter how well known, cannot easily be repaired. Brand assets, which are the stuff of real balance sheet value for many a conglomerate, need to be maintained, protected and valued. They are key elements in merger and acquisition and, for growing SMEs, need to be understood, valued and protected. Growing that asset requires strategy and day to day attention. To anybody who still thinks a brand is just a logo the carry on at the Co-operative Bank should convince them otherwise. Public Impact advises and mentors businesses seeking to maximise brand assets, create and re-fresh their brands and develop robust brand strategies. Get in touch for a chat. Happy New Year readers. I hope you got some time to put your feet up in front of the TV over Christmas. 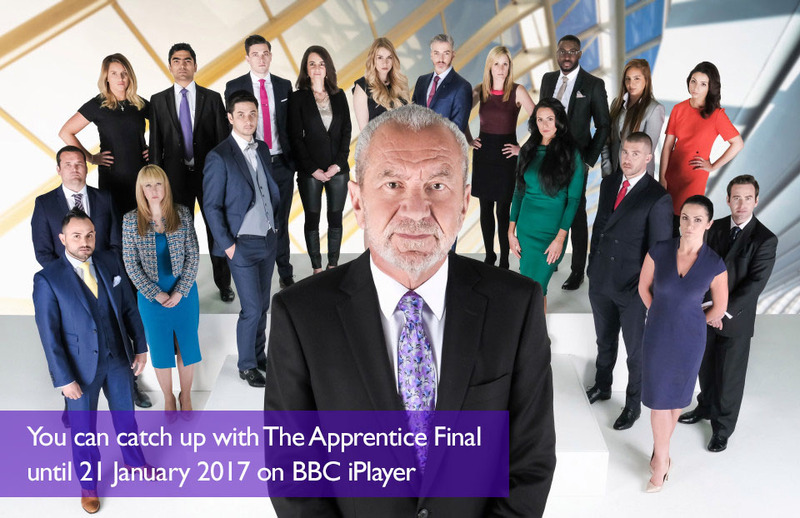 As running a reality TV show seems like the route to power these days I thought I had better look at season 12 of ‘The Apprentice’ that finished just before Christmas on BBC1. I’ve always had a whole bunch of reservations about ‘The Apprentice’ – not least the notion that all business is cut throat, that all successful people are pompous one-dimensional characters who speak in a strange clichés and that the majority of those involved seem not to have watched any of the eleven seasons that went before and, if they did, they learned absolutely nothing! But all that aside, ‘The Apprentice’ can be great TV (the early ratings suggest season 12 has held up reasonably well) and does contain some truths that are well worth noting. This year’s eventual runner-up was an interesting case in point. In the semi-final, Courtney Wood was taken to task in the entirely unrealistic interviews for his failure to project himself effectively or to speak with sufficient passion to be convincing in a pitch. One of my friends watching the show messaged me asking, “could you do anything with him?”. I replied, “Of course – everybody can present better when they learn the skills”. I’ve seen it happen so often. The product is great, the team is convincing but the presentation is a catastrophe, nobody is listening and the sale is lost by default. Tragic – and entirely avoidable – because presenting is a learnt skill, not a gift from some higher power. Some people are naturals, sure, but many more can learn to be professional – and that’s enough. All we want is the prospect’s attention to be focussed on what you offer and what it means to them. But too often unprofessional ‘form’ can detract from credible content. Come the final, 29 year-old Courtney addressed the issue with a crash course of presentation training. Some of it was gimmicky – but it still got him to think about how he could come across more professionally. Having managed to do considerably better and, importantly, having addressed a perceived weakness and proved he could improve considerably, Courtney still lost – but on the merits of his business proposal not by default because of his lack of pitching ability. Presenting to an audience is and will remain an important tactic for B2B sales and marketing. In business with which I’ve been involved I’ve always made the case for assessing the presentation performance of all the key staff is essential and, rather than throwing them into the deep end, providing the training that ensures it’s the company’s message rather than the mumbling salesman is what the audience remember. Just bear in mind that just because their cv said the new salesman has ‘excellent communication skills’ and even did a half-decent interview it really doesn’t guarantee they can stand up and talk in front of an audience – but they can learn. If, as I can mystically feel some of you thinking, the webinar or video will reach far more people than presenting in person, remember that presenting effectively on screen require a different skill set again. But even in the age of the webinar and SEO-based content marketing at some point in high value B2B sales cycles you are going to have to pitch and if it’s investment you are after you’ll need to do a great pitch. Remember people buy into people as much as they buy into proposals or business plans. I’ve been helping people to become better presenters for a long time now, you’ve probably seen some of them in action, and I know it pays to develop your presenters and sales folk. I won’t promise they will win a reality show but I can guarantee that with the right presentation training your people will have the knowledge and techniques to improve and won’t have any excuse for losing sales by default. If you would like to take advantage of Public Impact’s experience of enhancing presentation skill then click this link to get in touch. It’s easy to be cynical when you’ve worked with the technology industry for any length of time. The next big thing is always going to change the world. The next big upgrade is the ultimate change that’s going to deliver the ultimate user experience. Everything that went before is always obsolete. And so it goes. Sometime it’s true. Once we can see beyond the hype, once we have the benefit of experience, once expectations meet reality we can see the trends that really made a difference to the world and how and we can see those that we just, well, hype. To question the value of the latest technology trend is tantamount to sacrilege – especially for the technology industry. It’s an article of faith for many in technology that the latest thing must be better than what went before. It’s logical, after all, because if technology businesses don’t believer in the true faith then who will? After all, technology is a vested interest too. It is in the interest of all technology companies to promote the new over the old. It’s what they are in business to sell and given that so much new technology is, essentially, unproven in terms of its real delivery of bottom line or social benefits then its purveyors stand to lose from any evidence-based discussion of its real worth – because, by definition, at the leading edge we cannot really know. All this sounds a bit Luddite – but far from it, I’m a real believer that technology can create a better world. It’s about sorting the C5s from the iPhones and then deciding what the new thing does for me. The best technology helps us do things of which we could previously only dream, the next best technology enables us to do things better than before with a great deal less effort. Questionable technology enables us to do thing we’ve always done – we just feel smarter. One of the most successful social media campaigns Public Impact has organised delivered a return on investment of 15,400% – or 154:1, which includes time and opportunity cost. This was an easily quantified campaign with a very direct bottom line outcome. It doesn’t mean that the same level of business couldn’t have been won by other means, but we do know that the ‘other means’ would have cost at least 6.5 times as much. We also know that in this case we were engaging with exactly the right people through Twitter while email and surface mail were considerable less targeted. The point here is not to suggest that we can get the same return for another client using the same methods, quite the reverse in fact – we couldn’t and wouldn’t make such a promise. The real point is that choosing the right media, or even if the medium is right at all, is different for every business and every product. How much is this social media thing really costing us? What are we getting back and what do we really want? Will social media bring in business and if not, what can it do for us? Where does our audience live and which channels reach them? You would be surprised at how many businesses have not considered these questions. I was, but not anymore. These questions come before anything like; ‘how do we make this work better?’, ‘how do we resource this?’ or ‘do we want to be here at all?’ and certainly long before ‘what is the competition doing?’ or ‘should I be on Twitter, Facebook, Instagram, Snapchat or what?’. But now that we know so much more can there be any longer any excuse? While I would never promise a 154:1 ROI, I can commit Public Impact to help you challenge assumptions, to quantify what is really involved or what it’s really returning and, if you’ve not even gone there, to understand what really is involved. Then you will be able to look at your options and have confidence asking ‘what are the right social networks for my business?’ knowing you can come up with an answer based on evidence not just somebody else’s hype. 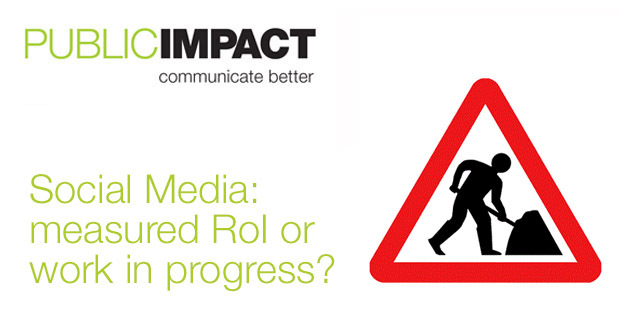 If you would like to take advantage of Public Impact’s experience of social media communications and start measuring what you are doing then click this link to get in touch. Neither of this year’s big political shocks needed to happen. Both were failures of strategy in which there are clear lessons for business communication. I’ve done a bit of number crunching in my time and I must admit I didn’t see the election of Donald Trump coming. It seemed a more secure prospect that Hilary Clinton would make it into the White House than the UK voting to Remain but, as one of the best of the number crunching sites, Nate Silver’s 538, pointed out to those who cared to listen, though the election of Trump was improbable it was never impossible. In 2012 Silver, despite polls at times closer than this years, placed the probability of Mitt Romney ousting President Obama at less than 10% throughout the campaign. Trump went into election day at 23% – a long shot, but far from out of the question. 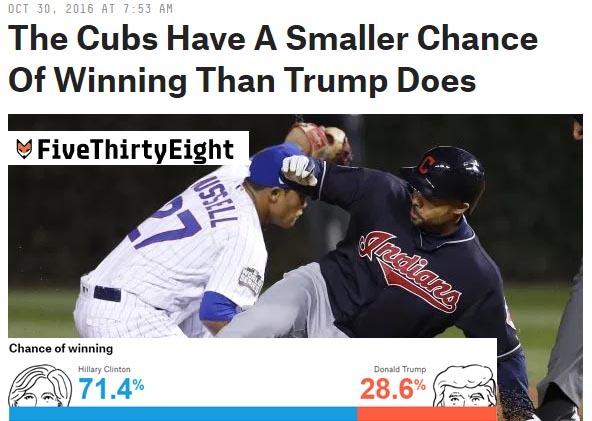 Ominously, Silver, who’s other great passion is sports statistics, wrote after the third game of the baseball World Series that the Chicago Cubs (then 1-3 down in a best of seven) had less chance of winning than Trump had of making it to the White House. The Cubs won the next three games and took the title 4-3. However, it wasn’t probabilities or polls that cost Hilary Clinton and Remain, these votes, the full significance will remain unclear for some time, were lost because of fundamental failures in the strategy adopted by the campaigns. To stay with Trump and Clinton first, it was clear for many months that the election was Hilary Clinton’s to lose. The Clintons had rescued the Democratic Party from situation where its only electoral victory since Lyndon Johnson’s Civil Rights legislation turned the southern states to the Republicans was Jimmy Carter’s in the aftermath of Watergate. Bill Clinton’s campaign explicitly rejected the notions of ‘rainbow coalition’ in favour of a return to the mainstream Democrat approach of looking to working Americans, the aspiring middle class and campaigning across rather than within the lines of social division. Barak Obama, though harnessing the African American and minority votes effectively, again did so with his focus firmly on majority issues of economic wellbeing. Despite this clear evidence of success Hilary Clinton’s campaign returned to the notion of the rainbow coalition – either by choice or by default. They did this because they perceived Trump as deeply unpopular among these groups – the problem is people don’t necessarily see themselves as part of a ‘group’. By taking the approach it did the Democrat campaign neglected the ‘economic mainstream’ issues that played heavily in the key states Trump won in the northern mid-west. Democrat messages were confused and fragmented, Trump’s were unconventional yet clear and his ‘inexperience’ in office was a positive for enough people to take a punt on a ‘businessman’ rather than a ‘politician’. Remain had similar problems. Faced by a Leave campaign with a series of simple assertive messages presented by eccentric but largely untested messengers, the Remain campaign sought to project expert opinion and, indeed, succeeded in demolishing the Leave case. Three weeks out from the vote (as with Trump) the Leave ship was sunk – their economic narrative had fallen apart and their vision of what might follow a Leave decision was shown to be non-existent, however there were still three weeks to go and Remain took the campaign onto migration. The Remain campaign, who’s messengers had no credibility on the issue, failed to engage and lost. The strategic failures were many, but firing all of your guns and running out of ammunition before the battle is over is never a good move and, while fighting on the ground of your choosing is an important thing to attempt in any strategy, having no battle plan for fighting on opponents ground is simply unrealistic. Remain knew two years before the referendum that migration would inevitably be part of the campaign but utterly failed to come up with a sustainable line of counter-attack. So what are the lessons for businesses in these two historic engagements? Ask ‘what if?’ – explore the possibilities and think about the unexpected. Play to your strengths but address weaknesses and prepare defence – because they WILL attack you. One way or other the two campaign that lost from winning positions failed on all three. Challenging assumptions is essential in forming strategy. It is also difficult, particularly for owner managers. The owner manager has, usually, come up with the idea, put in the money, worked long hours and put huge quantities of themselves into their businesses. Essentially, winning owner managers do positive thinking and they do it well. It is hard for employees to challenge effectively – particularly where there is a sole owner. This is where it gets dangerous because lack of challenge leads to lack of thinking leads to taking the field ill prepared. One of the most valuable aspects of Public Impact’s work on strategy is challenging internal assumptions as a critical friend. We tell you what you need to hear rather than what you want to hear. To find out more about Public Impact’s strategy development services click here to get in touch. Working with the public and private sectors over an extended period during which web and digital technology has developed rapidly has given us an insight into the implications of strategic decision making. In large organisations achieving any sort of agility in web presence is a rare thing. It seems to us that it has most often been achieved when the organisation in question breaks the web function down into components and has the vision to ensure that the different elements of the organisation genuinely take responsibility for the development and deployment of their own content. This approach runs against the grain in organisations where centralised decision making is the norm. One of the fatal mistakes made by businesses of all types, but especially public sector bodies, is seeing websites are primarily a technology responsibility. In fact the web stopped being primarily about technology way back, yet for far longer technicians retained control, often with a level of responsibility for content and influence over its presentation way beyond their skill set. Meanwhile those organisations with broader vision can still struggle with the real potential for devolved content management, their vision becoming hidebound by centralised administration and a lack of enabling skills and the failure to deal with imperial office politics. Very few print rooms are asked by their clients to oversee the content of publications or to pass opinions on whether it’s appropriate to use imagery. Of course not, it’s a ridiculous notion – but that’s what organisations do with their web presence as a matter of routine. In the local government sector the results are even worse. The adoption of standards based on futile attempts to anticipate the market and a false premise of ‘equal access’ has driven presentation toward the lowest common denominator and stifled innovation. The continued perception of the web as a ‘one off’ capital item, rather than a constantly developing revenue budget has also mitigated against progress. UK Government websites have reached a new low in presenting public information while ticking a myriad of boxes already out-of-date at first deployment. There are some signs of hope where the public authority is not the legal carrier, but it will take a major change of mindset to address the stasis. Where organisations have moved with the market and adapted their web presence to available technology they have put themselves ahead of the game. The rapid take up of open source CMS, WordPress, led to an expansion in the after-market offering tools, templates, themes and serious tools for online business. Now the market leader at a canter, WordPress may lack the security features to create comfort for the carriers of large scale personal information databases, but the range of tools now available now permit the combination of horses-for-course CMS technology to address different elements of the web presence of a large organisation. Of course being the market leader will itself make WordPress more and more of a target for attack – something their future releases will need to address. Crucially for SMEs, web platforms can now deliver rapid deployment without large capital outlay and can deliver ‘mobile-first’, SEO-optimised solutions with minimal technical involvement. This should make it more obvious that the essential ingredients of success are: an understanding of the audience, engaging content, a clear set of aims and the roles the site must fulfil and, most importantly, a strategy. Everything else – online brand guidelines, the platform, the content plan, house style guides, resourcing, budgets, technology decisions and tools flow from strategy. Understanding that addressing the website every couple of years just won’t do anymore is a good start. Public Impact helps all kinds of business develop and implement strategic plans for web and digital communications. Contact us here to find out more. What is a brand strategy and how do we get one? With a clearly defined brand strategy in place you have a roadmap to developing internal buy-in, creating brand ambassadors, building awareness and enhancing the balance sheet value of your brand assets. The brand is a modern management tool. Brands, if they are understood at all levels of the organisation, create a unity and common purpose. Businesses, to state the obvious, perform better when the whole team is pulling in the same direction. The brand strategy play a central role in creating and nurturing the understanding of the brand, its communication and its ongoing development. A brand strategy is far more than an enhanced set of brand guidelines. It is the plan of engagement in the battle to create awareness in the marketplace, the criteria for forming alliances with other brands and the road map toward acheiving the business objectives of the brand. Strategies are road maps for organisations and brands. To use a map effectively it is essential to know where you are right now – so it start with exactly that. An honest assessment of where the brand is at and how it is perceived within the business and outside. The next step is knowing where we want to end up – the definition of the destination and, logically, the steps along the way. But every journey has its barriers and usually rivals who what to get there first, so competitive analysis forms an essential part of strategy development as does understanding the means of travel – can you afford to travel first class and what’s the state of your equipment. You get the idea. You can muddle along without a strategy or you can be effective. Public Impact provides the framework and the critical friend who will challenge your thinking – and a real friend tells you what you need to hear, rather than what you want to hear. To live the brand you have to understand the brand and an effective strategy will encompass the creation of that understanding. An ultimate aim adopted by the most effective organisations is to create in every member of the team an ambassador for the brand reflecting the values of the organisation and practising its ethos in their daily rolls. 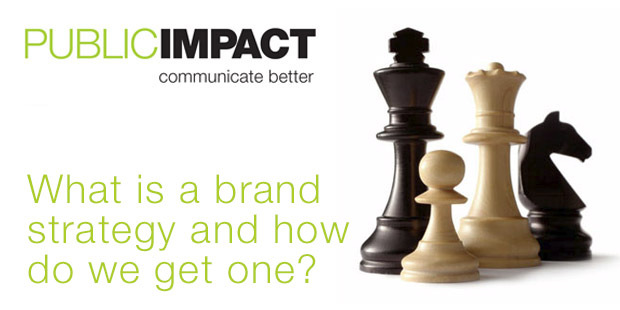 Creating and maintaining brand awareness is an essential marketing function of any organisation. Public Impact enables businesses to assess, measure and raise brand awareness through a combination of market research services and creative communications programmes. Objective setting, promotional programmes, advertising design, social media content and marketing programmes all contribute to the creative mix that helps improve brand awareness. A workshop approach is a great way of achieving the internal buy-in vital to both rolling out a new brand and putting in place a strategy for existing brands. Depending on your organisation the process may require one or a series of workshops for different groups of staff, management or locations. In developing brands we work with the culture of your organisation – and a workshop approach doesn’t suit everyone, but it remains a proven way of promoting the ownership and understanding that underpins success. Public Impact’s Strategy Workshops set out to develop the understanding of brand, examine the current state of your brand(s), test internal perceptions and ensure that leaders, managers and staff have direct input into a practical strategy for the brand going forward. Brand audits provide you with an in-the-round assessment of the effectiveness of your branding either on a corporate or product/service level. A Brand Audit is the first step toward getting a better return from your brand investment. The brand audit examines the fundamentals of the brand, how it is communicated through words and pictures, internal and external perceptions and the cohesion of brand design with values and how the brand relates to products and services. Brand audits provide you with professional brand consultant recommendations that enable you to make better informed decision on the direction of the brand and provides a road map for creative brand development through brand workshops, brand values, brand identity, logo design and brand management. If you want to quantify the performance of your brands and maximise the brand assets of your organisation get in touch for an initial chat. Public Impact Creative Director Jane Coney has cleared many thousands of images for use by major publishers such as Macmillan, Dorling Kindersley and BBC Worldwide. Here she sets out the basics that every marketing professional should know about using images in printed and digital communications. Here Jane provides answers to the 8 most important questions over image use that it’s dangerous to ignore. When can I use a Picture? What are the rules on copyright? There are all sorts of pitfalls for the unaware in choosing photos and images for use in promotional leaflets and digital marketing. Photo copyright, permissions and personal consent are all elephant traps that can cause unnecessary problems from businesses. The availability of images from the web has made it easy to capture images and easier than ever to sleepwalk into problems that your competitors can use to damage your reputation. It’s your responsibility to ensure that you have the right to use the images in your marketing materials and if you follow the steps set out in this article you should avoid being caught out when using photographs – especially if you place them on a social network like Instagram. Normally the rights to a photograph belong to the photographer (or to their employer). Photographers sell on or grant image rights to photo libraries and usage rights to media organisations, agencies and businesses. Rights can be bought and sold outright, for a limited duration or specific uses. It doesn’t matter who commissions or sets the shot up – the rights still belong to the photographer. These days a lot of photographers don’t bother where non-commercial organisations are concerned, but it is still wise to get an acknowledgement – an email will do – that you can use the shots as you intend. Does it matter where the picture is taken? Yes – and it can be complicated. The basic rule is that photographs taken in the public realm are owned by the photographer and need no permission. An image taken on privately owned land (which would include property owned publicly such as schools, hospitals and places with free public access such as shopping malls and railway platforms) requires the permission of the landowner – this is normally called a building permission/release. However common sense can be applied here – a head and shoulders portrait that is taken against a plain background will be OK – as the building cannot be identified it isn’t an issue. Also, where a location is hired for an event the building permission will become a matter for the hirer rather than the building owner – but it is always worth checking the hire agreement (not least so you can control the images at your own events). Does it matter what is in the picture? Yes and no. 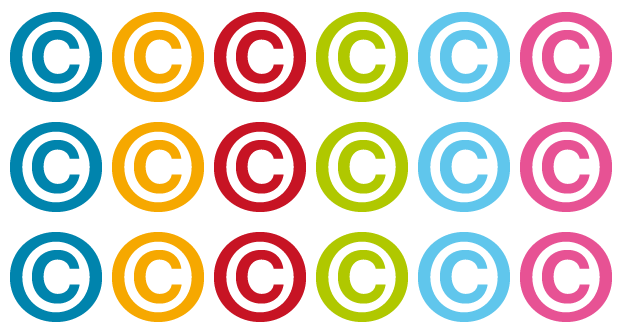 A picture that is taken in or from the public realm is generally free of restrictions – so items that may be subject to copyright, for example a company logo on a building, can be in the picture and legitimately used. So for example there is no problem with a photo call outside, for example, an energy company premises, so long as both the photographer AND the people in the photograph remain on the public highway. Beware of car parks and forecourts. In commercial situations this arises rarely but it is frequently an issue for not-for-profit charities and organisations with an advocacy or other public role. Does it matter who is in the picture? Again, the rights to a picture taken in the public realm belong to the photographer. Strictly speaking there is no need to gain the permission of anyone who happens to be in the picture. However if you are using an image to promote your company, products or services then you need a release from anyone involved and identifiable. This is because their presence is or could be taken as an endorsement of the product, company or service. When a picture is taken in a building you may need both a building permission and personal releases from those in the image. Crowd shots or illustrations of the public realm that clearly don’t imply endorsement may be slightly different, but many well-known media organisations will err on the side or caution, so you really ask if it is worth the risk. Can we include children in our pictures? Yes you can and they CAN be identifiable, but parental permission MUST always be obtained – and it should always be in writing. Get a model release and use it. Can we use pictures from Newspapers? Photos from newspapers are often the best ones to use because they are normally professional, well compose and lit – which means they look better when printed. It may seem obvious, but photos from newspapers or magazines of any sort always require the formal permission of the publication – and just because you, your boss or a member of your staff appears in the photo it doesn’t mean you can use it. Whether or not a newspaper will grant permission will depend on their corporate policy and on the attitude of the editor. If you do get permission, which for commercial organisations will probably include paying a fee, you may be required to give the paper or the photographer a credit alongside the image – it doesn’t need to be large, but don’t forget or it could come back to bite you. One good way of getting a free release from a local paper or trade journal is to do a charitable event – in that case they will usually provide a copy rather than look mean! Can we use images from the Internet? The Internet has changed everything – except copyright law (though it is trying pretty hard). Grabbing images from the internet is easy. It is also an easy way to get into hot water over the rights. We are not just talking about photographs here. Charts, drawings and logos all carry creative or commercial rights and it is an infringement of copyright to use those images without permission (in print OR on the web). This, again, applies to all kinds of images including portraits and, again, it doesn’t matter who is in the photograph. So just because the picture is of your Client’s CEO it’s not OK just to use it on their website – you may find the image belongs to a national newspaper or to one of their photographers, which wouldn’t be good. You should also be aware that things are changing. Social networks, through their terms and conditions may lay claim to image rights – very little of this has yet been tested in Court. There is always a great difference between theory and practice and copyright law is civil rather than criminal. In practice you could grab an image, use it without permission and get away with it. You could find that the magazine lets you off with a private apology or you could end up with a substantial bill that you have no choice but to pay. You may end up with a bad story in the digital media that hangs around, damages your reputation and takes up loads of time. The worst case is having to recall a product because the packaging infringes copyright – it happens. If in doubt, get advice. Follow those rules and you should be alright. Of course there are still questions of the usability of the image, its appropriateness to your message, what’s a legitimate use of Photoshop (other manipulation tools are available) and what makes a good picture – but they are several different blogs! John Howarth, as well as being Director of Public Impact, has been speaking in public since the age of 10 (sad isn’t it). He has spoken in front of all sorts of audiences – lovingly friendly and downright hostile. He is an authority on speaking techniques and provides public speaking and presentation coaching in North East England and around the UK. World renowned orators known for delivering high-profile platform speeches are often just as nervous before they speak in public as you or I. If you feel like most people about speaking in public you may well find this notion terrifying. Who could be blamed for concluding that if the great public speakers are nervous how will I ever get over my fear of standing you in front of an audience? The answer is simple. The greatest speakers and presenters did not just turn up one day with their ‘gift’ and start to rattle off their words of wisdom. They learnt a skill, practiced and became proficient gaining confidence in their ability as they went. While they were learning they looked at what they shouldn’t be doing just as much as what they should be doing. Have you got a hot date waiting? When you are nervous there’s a tendency to talk quickly. The faster you talk the less the audience will hear. It’s one of the most common fails in presentation and one of the easiest skills to learn – though it can take time to develop your own style. Slowing down your speech allows you to breathe effectively and by doing so you will find that your projection improves as you give yourself time to get air in and out of your lungs. Better projection in turn enables more expressive speech – even for those unfortunately blessed with monotone voices. Good public speaking coaching will devote plenty of time to breathing, body posture and pace. We’ve all heard, or tried to hear, speakers and left knowing a lot about the top of their head and little else. Looking down constantly is fatal – it says to the audience that you are not interested in them, that you are not confident about your material or both. It also makes it impossible to breathe effectively or to project your voice. As a general rule you need to make eye contact with the back row most of the time. If the back row can see your face, so will everyone else. There are more techniques that a good speaking coach will be able to convey to help ensure that the audience feels you are interested in them regardless of the type of room in which you find yourself. How often have you set in a presentation thinking ‘where exactly is this going?’ Quite often, I expect. It’s not how you want people to feel and it’s probably going to lose your audience as they drift off into thinking about something entirely different. A confident performer is confident of their material. In a presentation structure matters. You want the audience to feel that you know where you are going. In essence you are telling a story and a story should have a beginning, middle and end. A failsafe format is ‘tell them what you are going to tell them, tell them, then tell them what you’ve told them. Speaking coaches can help you develop these formats into a structure that will serve you through all sorts of talks. The presentation that over-runs its slot is a cardinal sin of public speaking. To get away with it you have to be very good indeed – and even then you have alienated the presenters who follow. We’ve all seen it, most of us have done it and it’s a really good way to lose the audience. So know how long you are meant to talk for and stick to it. But how? One of the main reasons why people over-run is because they speak to a PowerPoint deck with far too many slides, the second is speaking off the cuff with a lack of structure and the third is because they write out their speech-and try to cram in too much. In all cases failing to keep to time can be avoided with two simple precautions: rehearse and use a stopwatch (there’s one on that smartphone, remember! Do you think I can’t read? Nothing ruins a good talk like reading out the bullet points in a PowerPoint. The slides are meant to be visual aids, memory joggers – and it’s true that people remember much more when they see it AND hear it – but think key messages, not endless bullet points. The audience can generally all read themselves – so they don’t need you to help. Talk about the content, don’t read the content. Is this the first time you’ve done this? Then main reason the audience might think that is because it is often true. Failure to rehearse is the best way to deliver a bad presentation – you have no reason to be confident of the material, you haven’t tested your words, you’ve not tried out your delivery, you’ve not timed it properly. If you rehearse effectively – and that means doing the whole thing through at least three times, preferably at least once in front of a colleague who will act as critical friend – then you have reason to believe in what you are doing and it will ALWAYS be better for the practice. Professional presentation coaching will build up your rehearsal techniques, develop your preparation checklists and set you on the road to understand the method of public speaking. That builds your confidence and gives you the self-believe to turn the nerves to your advantage. Ask David Beckham (the next time you bump into him in the Dog and Duck). He’s the living proof that public speaking coaching works. He might be one of the best known faces on the planet but he is nervous when speaking in public and hated doing interviews as a young player. Now he’s at ease because he took the same approach to speaking as he did to taking free kicks – training and practice. If you think your presentation lets you down and nerves seem to get the better of you then get your manager to fund some professional presentation coaching – it’s money well spent and it works. The ‘it will never happen to me’ mindset is part of the confidence of being in business for many people. But disaster strikes and can it strike anyone, anytime. People die, people get sick, accidents will happen – health and wellbeing are key issues for small businesses. Not especially the health of those directly involved – that you can insure against to some extent, but the health of loved ones, especially those entirely dependent on YOU. The odds against what happened to a business we know were around 2 million to one – they had done some of the right things – the rest they learned fast. This might seem like a luxury that only Big Cos can possibly afford. But it isn’t. In fact a day planning for the worst can prove an invaluable investment. This isn’t because of the cost when something actually happens; it’s because something probably will happen. Having some idea who does what, how the messages will happen, who the key people are – it all makes a difference to how quickly you can get moving again – or how you protect the reputation of your brand. You don’t need fantastic detail – every crisis communications plan has to be adaptable – but an outline should be considered essential. Doesn’t everyone these days have the ability to work from anywhere, anytime? Don’t we all have our software in ‘the cloud’ can’t we easily connect to pretty much anything? Err, well no. We were lucky. It had long been part of running Public Impact that a seamless service to client meant being able to access whatever we needed from anywhere in the world. So getting to the office didn’t matter so much. Much more to the point we had a great IT support company who could advise on or set up anything additional that we needed very quickly. It is important to say that this is not just about being ‘in the cloud’ – it’s about having the right remote access arrangements that are right for you based on you current set up. If you normally do the tech yourself, for good reasons, you may well find that when bad things happen it just isn’t viable to continue that approach. All business is built on trust and the greater the trust you have in your suppliers the easier it is to cope when events intervene. Knowing you can effectively delegate key aspects of your work to your supply chain in the near certainty that they won’t let you down is a huge weight off your mind when disaster strikes. So look after your suppliers when times are good. Communication always matters – but the decision of how and what to communicate to the organisations with which you do business has to be conscious. Sometimes the right thing IS to do and say nothing – so long as you believe that you can continue to deliver service. Always bear in mind, however, that all business is built on trust. Honesty and openness builds and maintains trust. So considerer whether to say anything, what to say, when to say it and by what channel. The default for everyone is ‘muddle through’. The reality is muddling through is just that – a muddle. So be clear in your own mind about the priority. For most people top of the list will be the continuation of service deliver. Your reputation as a provider of professional, good value services is paramount – lose that and the damage to your business can become permanent. So it’s not rocket science – the thing at the top of the pile on your desk or at the top of your inbox is not always the most important. 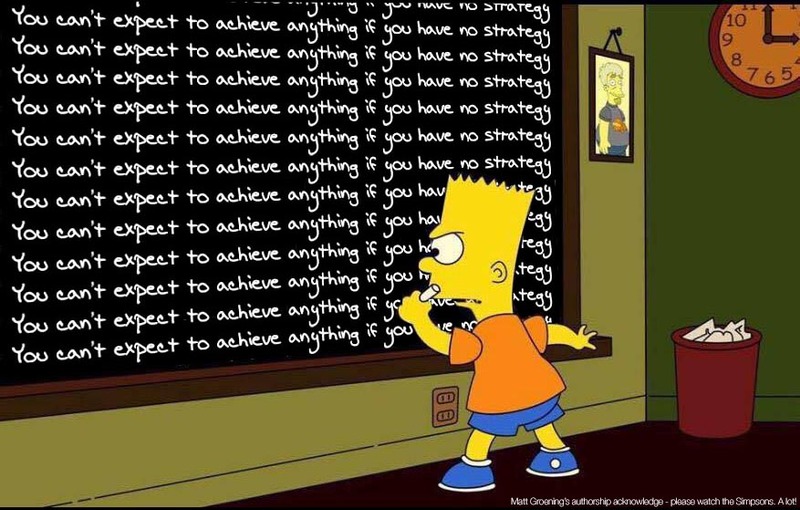 So revise the strategy – go through everything as soon as you get the chance and make lists of everything – then decide what’s got to happen, what’ going to happen and what can’t happen right now . It’s not just sensible organisation, it’s good stress management too. Once you have your lists you will be able to buy yourself time by scheduling or rescheduling clients into the future to buy time. It’s all about calling them before they call you – you might appear to be creating more work – but by massaging the relationship you keep the door open. Finally, remember why you are doing what you do and that (hush!) life is more important than work. Set you own boundaries for dealing with the immediate issues on your lists, find something good in the day, understand you can’t always make progress but be glad that you’re still here. Above: It was You Guv! – the archive figures showing the election neck and neck. Public Impact Director, John Howarth, has been crunching numbers most of his life. Here he explains why the 2015 General Election did not ‘discredit’ opinion polling and why businesses can and should continue to rely on the numbers. Say I’m ‘on the spectrum’ if you like, but I’m very fond of numbers. In an uncertain world with shifting motives and inconsistent people numbers are reliable, constant and, ultimately, the only logical truth. Numbers are the friends you can rely on. At the UK General Election in May the opinion polls were wrong. Of course it wasn’t the numbers as such that were wrong – more a reflection of the people manipulating and using the numbers. Now, apparently, we know why the numbers were wrong – it was all about the sample selection not reflecting the real turnout pattern. But, of course, there are a few things that could get a little lost in this debate, so because I like to be loyal to my friends I feel the need, before breakfast, to make some points in defence of numbers. The polls have always been ‘wrong’. During my lifetime the polls have failed to predict the result of the election on three occasions: 1970 – when the data took much longer to compile and Ted Heath’s ‘late surge’ was missed; 1992 – when they failed to pick up on the electorate’s aversion to the concept of Prime Minister Kinnock; and in May 2015. In each case the election was thought to be relatively close, in each case Labour lost and in each case a ‘late surge’ benefited the Conservatives. However in other elections polls were also ‘wrong’ – but, because the margins were clearer and the winner was in line with predictions, polling ‘error’ was not regarded as such a serious business. For example, in 1997 and 2001 Labour’s lead was over-stated in many polls, in 1983 and 87 the Conservative lead was understated. Nobody made a fuss (1). The polls are not Labour’s friends – are they? It is a favorite saying of mine that your true friends in politics are the people who tell you what you need to hear rather than what you want to hear. In that respect the polls have not been Labour’s true friends. Activists of whichever party want to believe that their party, or their faction within their party, is doing well and is going to win. Voter contact by political parties has an in-built confirmation bias – everyone spends more time working on their own supporters, so it often seems like you are doing fine and, in any case, if you didn’t delude yourself you would just go to the pub instead(2). It is a reasonable conclusion, however, to suggest that polls during the 2010 Parliament were consistently ‘wrong’ and so affected the thinking of Labour’s high command. In the light of different information different decisions may have been made – maybe. So their argument seems to be that they really were deluded – just rationally so! Park that thought for a moment. It’s an iron rule of political media technique that one should not answer a hypothetical question. It is a simple fact that every poll more than a couple of months away from an election campaign is asking a hypothetical question about ‘an election tomorrow’ that is not going to happen tomorrow. People answer that question honestly – they are not being asked how the WILL vote come the real election. Mid-term opinion polls as well as mid-term local elections and by-elections tend to punish the Government of the day. That’s also part of the psychology at play when answering that hypothetical question. They are not making a serious decision about an alternative Government – the electorate is sending a message, either through the ballot box or via the pollsters. The polls provide a snapshot of opinion, yes, a true reflection of what will happen, no. Following from the hypothetical question, polls are not predictions, they are not meant to be. The polling companies always say so. The politicians don’t listen unless it suits them to do so – and in any case no politician can ever say ‘we are going to lose’ – even when it is screamingly obvious that they are. Perhaps we should be less surprised when something that isn’t a prediction fails to predict. Do the polls ever tell us anything? Despite all of this the polls tell us quite a lot. They show us movements, trends, patterns. Their relative position against real results can produce reliable estimates around which decisions can be made about campaigns and resources. They can show regional differences. They are often ‘right’ in relative terms even when they are ‘wrong’ in absolute numbers. This is what number crunchers do – we learn to read the numbers. 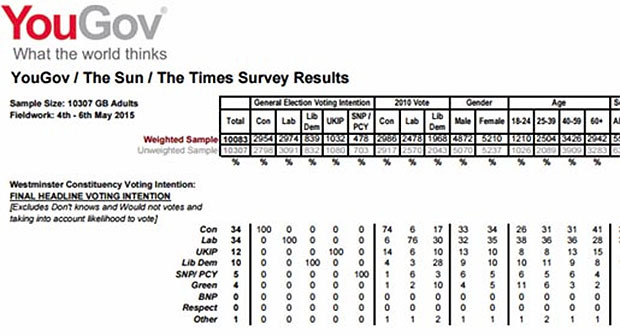 There was much in 2015 that the polls had to tell – the Labour Party just didn’t want to hear it. This is why it is self-serving nonsense to suggest that Labour’s high command may have made different decisions in the light of different polls. I don’t think so – the justification for inertia would simply have been different. Labour claim’s that they were ‘duped’ by the numbers doesn’t stand up to analysis. This delusion was far from rational – they only saw the numbers they wished to see while the reliable indicators told a different story – as did others (3). Some peddle the crazy notion that opinion polls that present uncomfortable evidence are part of some great conspiracy. Sadly this is part of a world view that is equally help at the extremes of left and right and is, I’m afraid, entirely barmy. The numbers are what they are. The polling companies do not want to be wrong because being seen to be wrong is bad for business, not least because they are generally correct. The real horror for Labour, given that polling ‘bias’ has now been proven to ‘favour’ Labour, is not what the polls said about the outcome of the last election it’s what they are saying right now. It remains a fact that people lie, numbers don’t. (1) the evidence of this is ample – see the various Butler et al publications detailing polls and results, the work of Thresher and Rawlings and the likes of John Curtis. (2) when the appeal of a party is narrow but deep this effect can be even more pronounced – which is why in both 1983 and 2015 Labour activists reported ‘great ethusiasm’ on the doorstep. Their delusions weren’t entirely baseless – but it didn’t mean they weren’t getting thrashed. (3) see Andrew Rawnsley’s mea culpa piece in The Observer, 17 Jan 2016.